- Show you a hole in your understanding of physician leadership. These are things everyone admits are true, but no ever talks about. They function as hidden traps for you if you are new to your leadership position. 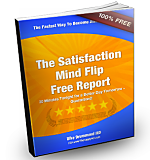 - Show you simple methods to avoid these traps to get more done, in less time, without working harder in your leadership position. "Physician Burnout is a tried and true path to leadership"
Build your leadership Power Skills at our Quadruple Aim Physician Leadership Retreat. 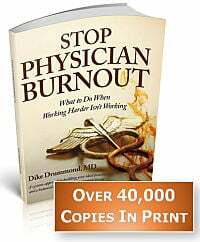 "Dike Drummond here from the HappyMD.com and in this video in our physician leadership's dirty little secret series, I'm going to show you how for many physicians the path to physician leadership goes through physician burnout. In my physician burnout coaching practice I work with a lot of physician leaders and here's a real common story about how they got to their leadership position. Many physician leaders these days begin in a full clinical practice and over time they migrate to a part time clinical and leadership job. For instance they may be three-quarter clinical and one quarter time medical director and when I ask them how they got there here's what becomes clear very quickly. The position opened up and they volunteered for the position because they were burned out on seeing patients. And they knew that this part of their job would not involve seeing patients. "Doesn't involve the seeing patients?" And that's how they got to be in their physician leadership position. In some groups where I'm doing a leadership academy and am with only leaders in an organization, and I ask people, "raise your hand if that's how you got into this position…", Up to 70% of the people in the room will raise their hand - if they are being honest. So a dark little secret of physician leadership is this – burnout is a tried and true path to leadership. You may take the position because you are burned out with patients. You may take it because it involves skills and duties that are completely unfamiliar to you. 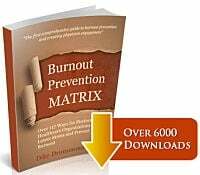 Begin to work on your own personal burnout prevention strategy. Realize now that the stresses that can cause you to burn out – in this straddle position – part time leader and part-time clinician – have been effectively doubled. Because you know as well as I do that working as a leader isn't any less stressful than seeing patients. Work on your own personal physician burnout prevention strategy so that you can be a positive role model for the people that you are leading. 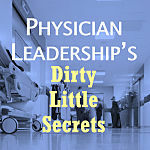 Watch for the other videos in our Physician Leadership Dirty Little Secrets Video Series for some more tips on how to become a better and better leader if you are in a straddle position. That's all for now, have a great rest of your day"